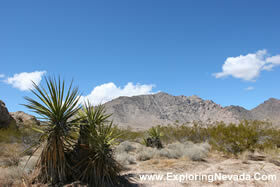 Christmas Tree Pass is a pass that leads over the Newberry Mountains in southern Nevada. The road that crosses the pass is called, appropriately enough, Christmas Tree Pass Road. The road begins just outside the town of Laughlin off of NV Highway 163, and ends to the south of the tiny town of Searchlight, NV, on US Highway 93. This scenic drive is twelve miles in length. The road itself is gravel and is generally in good condition. However, in a few places the road can be a bit rough and steep, particularly right below the pass on the eastern side. Although some careful and slow driving will allow a passenger car to traverse the occasional deep ruts and holes that form here - a high clearnace vehicle can be quite helpful. The trip over Christmas Tree Pass is very enjoyable. You get some fine views of the Colorado River valley down below, where Laughlin is located. And you get sweeping views into Arizona. 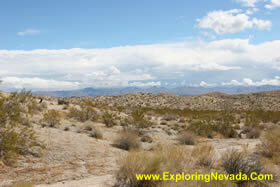 And once you reach the western side of the pass…the sprawling Mojave Desert just goes on and on. The road also leads to the trailhead of a wilderness that is part of the Lake Mead National Recreation Area and also passes by a short trail that leads up to some interesting Indian Petroglyphs. Traffic on the Christmas Tree Pass Scenic Drive is very light. Nobody lives along the road, so the only people who use it are people either heading out into the backcountry to explore or simply want to drive this short, scenic drive between Laughlin and US Highway 93. While the Christmas Tree Pass Road isn't a trip I'd call a "destination scenic drive," if you happen to be traveling between Laughlin and Boulder City or Las Vegas, then this road is a very worth side-trip, as taking this drive will only add about 45 minutes to your trip. Road Type - The road is gravel. Most places in good condition, but a few spots are steep and rough. High clearance vehicle is helpful in spots. RV's / Campers? - Not the best of ideas. Services Available - Gas, lodging and supplies can be found in Laughlin. General Location - Southern Nevada, south of Las Vegas and right along the Colorado River.. Camping - The BLM owns lots of land along this drive, so you can camp anywhere. There's plenty of RV camping in Laughlin, too. The best place to stay is Laughlin, which has tons of inexpensive hotel rooms and many affordable places to eat.